Driven by the need for untethered mobility and ease of use, many systems rely on rechargeable batteries as their primary power source. The battery charger is typically implemented using a fixedfunction IC to control the charging current/voltage profile. The C8051F300 family provides a flexible alternative to fixed-function linear battery chargers. 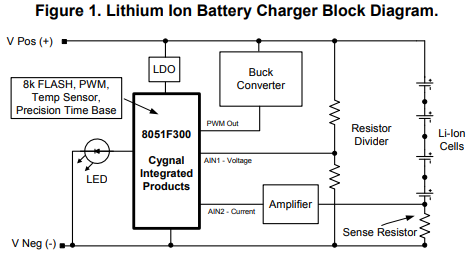 This note discusses how to use the C8051F300 device in Li-Ion battery charger applications. The Li-Ion charging algorithms can be easily adapted to other battery chemistries. This entry was posted on Sunday, April 22nd, 2018 at 1:00 pm	and is filed under app notes. You can follow any responses to this entry through the RSS 2.0 feed. You can skip to the end and leave a response. Pinging is currently not allowed.